When based in reality, film has the power to instruct, to educate and to motivate. THE BEST OF ENEMIES, opening in theaters today, succeeds in taking a challenging story and turning it into a strong and needed life lesson. Exactly because it's inspired by "real life", THE BEST OF ENEMIES is a film that's challenging to watch. In 1971, years after a groundbreaking school desegregation case in the Supreme Court, the education system in Durham remained purposely outside the law. Resolution seems impossible. Hate, distrust and ignorance seem to reign. 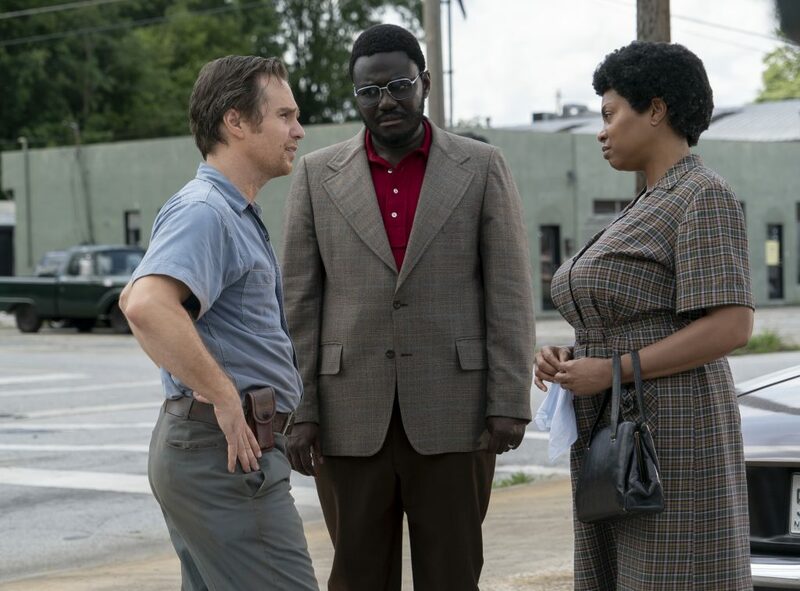 Inspired by the book The Best of Enemies, Movie Edition: Race and Redemption in the New South by Osha Gray Davidson, first time director Robin Bissell's film does an effective job of mentally transporting the viewer back into a time that feels so distant and inconceivable. The film takes some liberties with minor factual details (see an interesting timeline of the events here). But at its heart, THE BEST OF ENEMIES is a character examination. Ann Atwater, impactfully portrayed by Taraji P. Henson, and C.P. Ellis (Sam Rockwell) are firmly entrenched enemies. Atwater, a tireless (and may I say "booty kicking"?) activist has given her life to fighting for her community. Ellis, the "Exalted Cyclops" of the KKK, believes to his core that he is choosing the right path for his neighbors. ...until he realizes he isn't. THE BEST OF ENEMIES is a look at a slice of history that is thankfully behind us. But what impacted me most about the film is that it reminded me that our world today--our country and even some of our churches--are still rife with a separation that often devolves into hate. We too often choose our battle lines, convicted about our own rightness and incapable of civil dialogue. THE BEST OF ENEMIES helps us get to know Atwater and Ellis, their families and the life circumstances that have formed their hearts. When chosen to help lead a community "charrette" or negotiation process with organizer Bill Riddick (played by Babou Ceesay), Atwater and Ellis come to know one another on a human level. Their ultimate relationship, with a basis in respect and mutual understanding, helps lead their community to healing and resolution. Even though this is a movie, THE BEST OF ENEMIES offers me hope that when we come to our disagreements with respect, with an open heart, and with trust that right and justice can prevail. 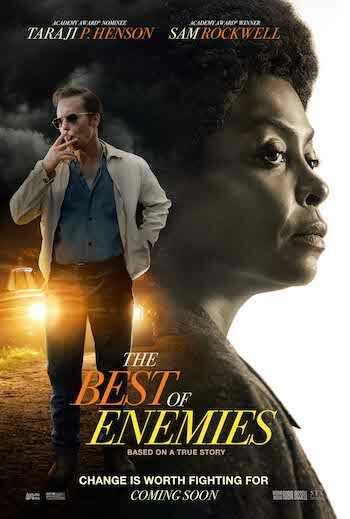 THE BEST OF ENEMIES is rated PG-13 for thematic material, racial epithets, some violence and a suggestive reference. Parents of older teens may find this a film an opportunity for explaining history and discussing the potential for true conflict resolution.